With bus 1 we had an extra day of traveling and meetings in Oostende today, even though, strictly spoken, we had already arrived home on Friday. This pre-welcome home party was a very heart warming event! 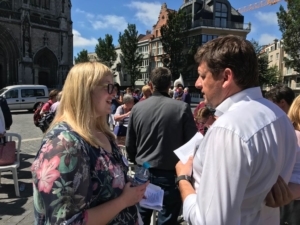 The Belgian EMIN network had planned a morning session of discussion with people experiencing poverty on the negative effects of the status of co-habitants in the system of minimum income, as in other parts of the social protection system, the so-called ‘price of love’. 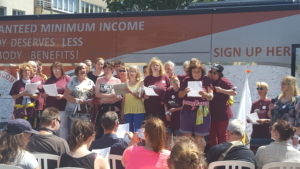 They want to send their recommendations on this very subject to the negotiating table of the government, as it constitutes a major injustice in the Belgian minimum income scheme that leads to many Kafkaesque situations in people’s daily lives. In the afternoon, we met on the sunny Sint Petrus and Paulus square, near the harbour, where we were welcomed by many volunteers. 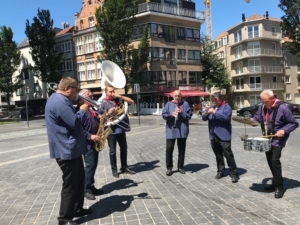 The Movement of People with Low Income and Children sang us the Fourth World Song on the tones of the ‘Moor soldaten’, a song that was symbol for resistance during the second World War, and today is sung to protest against poverty and exclusion. Then the Manifesto of the Belgian Network was presented, made in view of the coming elections next year in Belgium. (See here in French and Dutch). The Manifesto focuses on the necessary increases of minimum income schemes and of minimum wages, the reform of the co-habitant status, reduction of conditionality in access to benefits, automatic granting of benefits and against precarious jobs. The Manifesto also urges the next government to advocate for a European directive for decent minimum income for all. Several partners in the Network testified their support for this Manifesto on stage: Martine Van de Walle for the Christian Mutuality insisted that decent income support is key to give people access to quality health care and noted that people living on an invalidity pension, especially single persons and families with small children, cannot make ends meet. Koen Meesters from the christian trade union ACV reminded the government of their promise to raise all benefits above the poverty threshold, a promise that was never fulfilled and that needs to be re-iterated for the next government. Raf De Weerdt for the socialist trade union ABVV insisted on the need to raise the lowest incomes. He also reminded us that thanks to trade union achievements such as automatic indexation of wages and the existence of a strong social protection system, the social situation in Belgium did not turn into a complete catastrophe, despite the cuts and savings on income that were done by the government. People who have experienced poverty told us their personal stories about the difficulties they face to live a life in decency. 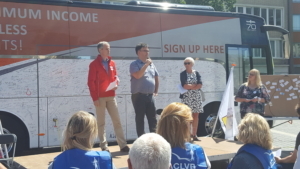 The partners of the network and the leader of the social-democrats, John Crombez, added their signatures on our EMIN bus. Lots of people also signed our petition! With music and warm goodbyes we ended this day, hoping to see many people back at the occasion of our welcome home party in Brussels on Thursday!